The Costa Verde Holiday Village and Campground at Capo Vaticano is a small, independent vacation center on 16,000 square meters between Tropea and Capo Vaticano: the most prestigious stretch of the Calabrian Tyrrhenian coast. Here the climate is temperate even in July and August, and visitors appreciate the natural absence of insects and mosquitoes. The sea is renowned for its transparency and color, with water that has received the Environmental League's European Blue Flag award for years. The area offers unforgettable views of the Stromboli volcano and nearby Aeolian Islands. Nearby on the same beach, visitors will find independent and outside boat rental services, scuba diving schools, diving and sailing clubs, and more. Within 2 km inland, there are tennis courts and riding schools. 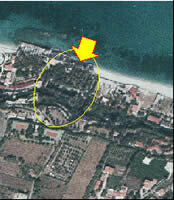 The campsites, bungalows, apartments and cottages (all masonry) are between 20 and 60 meters from the beach. The absolute absence of roads, railways and towns guarantees tranquillity and safety for children. With the spareness typical of the great outdoors, the joint family management is geared to providing. Functional structures and convenientt, continuous services at all times (reception, bar, minimarket, restaurant, entertainment), with special attention to the needs of guests, the final cost of the vacation, cleanliness, order, and courtesy. General map of the COSTA VERDE vacation village and campground. The north and west beaches are visible. Their size may shrink after sirocco storms and increase considerably after mistral storms. The internal access road is also visible. It is partially wooded and located on five ramps with an average incline of 6.5% (maximum incline 8% on the last curve at the bottom). Aerial view of the COSTA VERDE vacation village and campground.The 16,000 m2 vacation village is outlined in yellow and includes both the upper portion, 45 meters high (with free parking) and the beach level with campsites, restrooms, residential units, bar, mini-market, restaurant and reception area.